An Infiniti concept electric SUV that ruined a press conference because it wouldn't move from back stage is now on display at the Detroit auto show. The Infiniti QX Inspiration concept missed its introduction Monday morning and remained covered by a black tarp until early afternoon. The sleek white concept vehicle was being photographed on the stage. 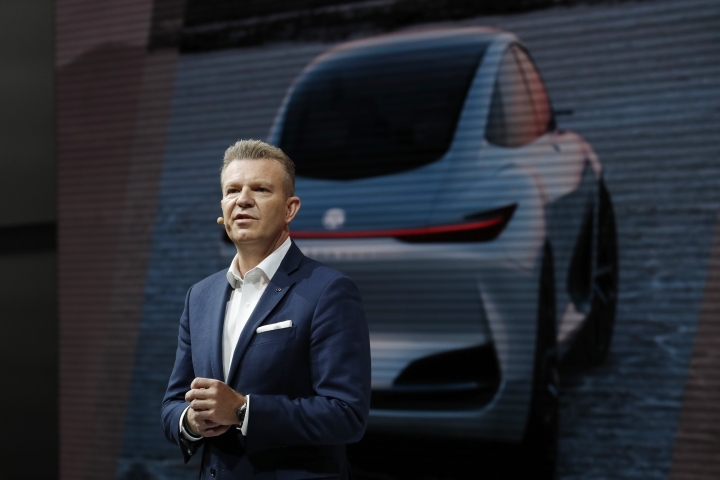 Ford Motor Co. and Volkswagen AG have scheduled a conference call for Tuesday morning to announced details of a partnership that's been under negotiations for months. Volkswagen CEO Herbert Diess, Ford CEO Jim Hackett and other executives will be on the call. Diess said Tuesday at the Detroit auto show that the partnership would include cooperation on small commercial vehicles, vans and midsize pickup trucks. He said VW is a big car company, but is not big in those areas. "We decided to join forces there and we will become very competitive together in this segment," he said without giving further details. No matter how much you rehearse, sometimes the elaborate product announcements at auto shows don't go as planned. On Monday morning, a temperamental Infiniti electric concept car wouldn't run and couldn't make it on stage for the Nissan luxury brand's news conference. Karim Habib, executive director of Infiniti design, explained some of the SUV's high-tech features, including futuristic dashboard screens. But when he said "Here it is!" a video was displayed on a large screen behind the stage, but the car didn't budge. "You can't see it but it is here," Habib said sheepishly before starting a speech about more of the vehicle's attributes. "The Infiniti QX Inspiration, like many stunning beauties, is a bit of a diva and decided to delay her debut," brand spokesman Trevor Hale said in an email. "That's show business." Major job cuts and or alliance with other automakers are not in the plans for Italian-American automaker Fiat Chrysler, the company's new CEO says. Mike Manley, who took over for the late Sergio Marchionne last year, said the company downsized its workforce significantly during the global financial crisis a decade ago, and smaller cuts have been made since. So unlike crosstown rivals Ford and General Motors, he doesn't expect any "big bang event." But Manley says FCA is now in a different position and can go it alone. "We know we have the resources. We have the balance sheet strength," he told reporters Monday at the North American International Auto Show in Detroit. Although he's not looking for large-scale partners, Manley said he would be foolhardy to rule out any offers. He also confirmed plans to add factory capacity to build larger 3-row Jeep SUVs that are in the works. He wouldn't say where but there have been reports it will reopen a factory in Detroit. He said the additional jobs created will be significant.